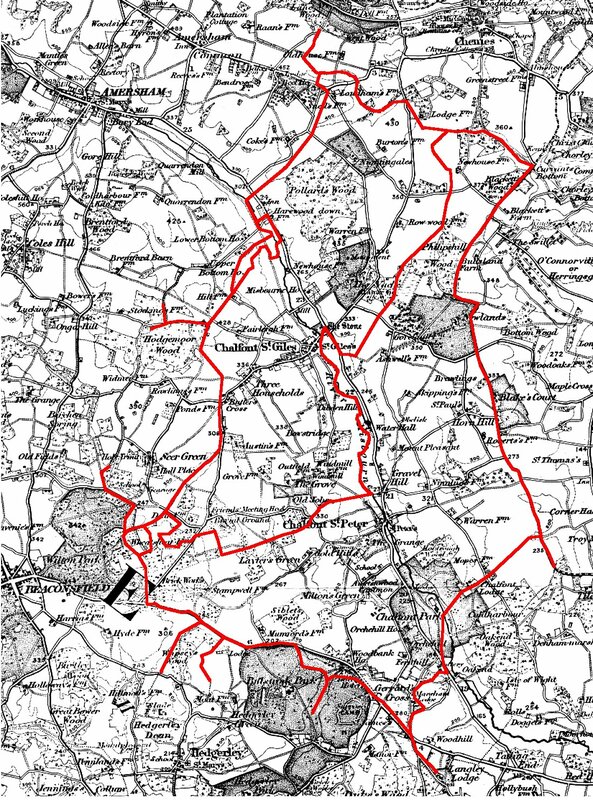 The evolution of the parish boundaries of Chalfont St Giles and Chalfont St Peter. Although the parishes of Chalfont St Giles and Chalfont St Peter were formed before the Conquest there is evidence to indicate that the line of the boundary between them was not fixed until much later and is primarily based on the maximum extent reached by the Missenden Abbey's Manor of Chalfont St Peter. The generally accepted view is that the Chalfont St Giles and Chalfont St Peter parishes date back to the late Saxon period and were based on two manorial estates that were subsequently taken over by the Normans. According to the Domesday Survey Chalfont St Giles was assigned to Mainou the Breton and Chalfont St Peter to Bishop Odo. It is also often surmised, although there is no evidence other than topographical and the sizes given in the Domesday survey, that at an earlier time in the Saxon period they were together in one estate. I would not argue against any of this. However there also seems to be a general presumption that once the boundaries were set prior to the Norman Conquest they did not change until the 19th and 20th centuries. I would argue that this is not likely and in fact there were some significant changes to the boundaries which were brought about by the growth of the Manor of Chalfont St Peter under Missenden Abbey. More specifically the "historical" parish boundary between Chalfont St Giles and Chalfont St Peter is based on the boundaries of Chalfont St Peter Manor after Missenden Abbey acquired land through charter and only became fixed in the 15th and 16th centuries. This probably also applies to other parts of the Chalfont St Peter boundary but I have not looked for evidence in those locations. The earliest date for which we have definitive evidence of the position of the parish boundary is 1777 when, for some reason yet to be determined, a series of dated boundary stones were erected around the Chalfont St Peter boundary. This boundary, as then defined, remained in place and was recorded by the Ordinance survey in the 19th century. I am led to this belief for the following summary reasons which I will expand on later. 1.) There are no Missenden Abbey land holdings within Chalfont St Giles or across the historical parish boundaries. 2.) The detached part of Chalfont St Peter between Chalfont St Giles and Amersham correlate exactly with a Missenden Abbey landholding (Eddred's crofts). 3.) The very peculiar extension of Chalfont St Peter Parish which lies between the river and the London Road and comes right up to the Chalfont St Giles churchyard and Pheasant Hill correlates with Silusden land given to Missenden Abbey by charter. It could be argued that if the boundaries of Chalfont St Peter Parish expanded as the Manor gained land why then did they not shrink back as they lost land. I think the answer lies in the fact that the Manor owned the Advowson of the parish church and so retained the tithes from the parish. Additionally the Tudor poor laws introduced in the 16th century would tend to reinforce the maintainance of the existing boundaries. This theory would explain what are otherwise difficult to explain boundary positions. In the Domesday survey both parishes are given the same size of 4 hides and 3 virgates and broadly the same number of inhabitants and woodland yet at the tithe survay in 1838 the acreages are subtantially different, 3690 for Chalfont St Giles and 4719 for Chalfont St Peter, reinforcing the case that the parish Chalfont St Peter grew at the expense of Chalfont Giles as Missenden Abbey gained land. REFERENCES. Unless otherwise specified, all references given above refer to catalogue references at the Centre for Buckinghamshire Studies at Aylesbury. (County Record Office).